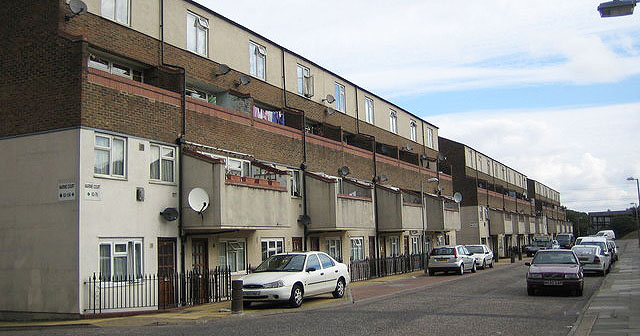 "Welcome to Garrison Estate Purfleet, home to chavs, druggies and jobless layabouts. At first glance you would think it’s a lovely place to live with lots of green spaces and historical buildings, but once you walk about you soon begin to see it’s true colours. Purfleet has one school one shop and a few beaten up kids parks. Walking to the local shop you will be lucky if you don’t get high of the fumes from the local gangs, who happen to stand around all day smoking drinking and driving stolen motorbikes on the paths. The buildings here are full of broken glass, graffiti and haven’t been painted since the time they were built. Nothing here is maintained and the people who live here only add to it. They seem to be purfectly (pun intended) happy to live in their own squalor. Most are normally drugged up to their eyeballs doing the school run. Once you hit the school gates you’re welcomed by the sound of mums swearing at their children while happily chugging on a cheap cigarette. Don’t walk behind anyone unless you want to step on their discarded cocaine wrap. No matter what you do, don’t leave your car unattended unless you like spray paint and no wheels or if your really lucky, they will set the whole thing alight. Transport links are rubbish and buses won’t even run onto the estate during firework season for fear of being blown up by a rogue rocket a child has stuffed inside the exhaust. They do have the river walk which is its only redeeming feature, but all in all, Purfleet is a pretty abysmal place to live. If you like drugs and not working, then it’s the place to be. However, if you’re like me then get the hell out of dodge." As I was reading this, I thought ‘wow what a depressing place this must be to live in’. I felt God give me a word of encouragement for the lady who bought the hoodie so I wrote it on the back of her invoice. God wanted me to share with her that she would be light and life to those in her community and that she would bring hope to those she comes into contact with. So with every order, I never know who is buying my products and what impact they will have. I am going to endeavour to pray for each customer that buys from my website in the future and ask God to give me a prophetic word or a word of encouragement to share with them.